Thermofoil is an excellent choice for custom cabinetry. We manufacture many thermofoil cabinets ourselves in out West Bloomfield factory. You’ve decided on a style for your dream kitchen or bathroom and narrowed down your selection of colors. Perhaps you’ve compiled a Houzz Ideabook or a Pinterest board with gorgeous photos of kitchen or bath designs. But have you considered the type of material you would like to use on your custom cabinetry? With the wide variety of options available today, the choice can be challenging. A gray wood door, for example, can be achieved with real wood, painted MDF, wood veneer, wood laminate or thermofoil. Which is better? Thermofoil cabinets are easier to clean and maintain than wood. Simply wipe them down with a damp sponge or cloth and some mild dish soap. Stubborn residue can be removed with a nonabrasive cleaner. 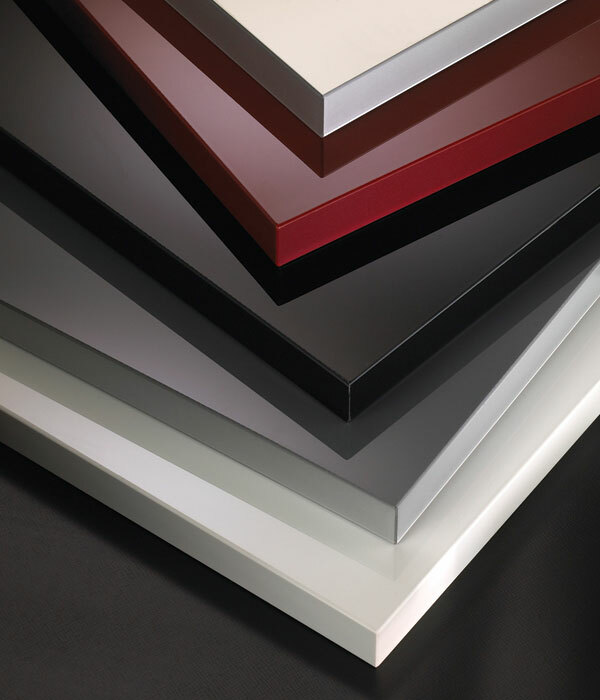 Good-quality thermofoil cabinetry is durable and long-lasting. Unlike wood, which tends to show wear over time, custom thermofoil cabinetry retains its original beauty year after year. Thermofoil is moisture-resistant, making it ideal for use in areas with high humidity (bathrooms) or exposure to water (kitchen sinks). Wood-look thermofoil has controlled wood grains and can offer a more consistent grain pattern than real wood, making it a highly versatile material for design. When using with a horizontal wood-grain pattern, thermofoil blends flawlessly. Thermofoil can also have a more variegated “natural” look for more traditional designs. Thermofoil is less expensive than real wood, making it easier to realize your dream kitchen or bath within your budget. Thermofoil is available in broad range of designs and colors. Whether your dream space is traditional, transitional or contemporary, there’s sure to be a thermofoil option that matches your vision. Of course, there’s still a place for real wood in custom kitchen and bath design. Wood is timeless, and its intricate patterns and matching crowns and moldings sometimes can’t be achieved with any other material. However, if you’re looking for a high-quality, versatile alternative that fits your budget and your space, consider using thermofoil. It’s a beautiful option for custom kitchen and bath design.